Antispam solutions can be of great use if you or your business is experiencing huge volumes of spam emails. With the Internet becoming the dominant platform for businesses to reach out to the customers, unsolicited bulk email aka spam has reached epidemic proportions. As more and more digital marketers’ turn to bulk email as a viable means to reach potential customers, this trend of sending unsolicited bulk emails will continue to rise. Spam has become a quite an annoyance affecting individuals and business alike. Usually, malware attacks caused by viruses, worms, adware and Trojan horses catch people’s attention, but spam is arguably a more serious security threat. This is because spam affects every Internet user (directly or indirectly) and there is no viable solution to spam when compared to antivirus software programs. Antispam solutions come handy for such scenarios. With a proactive Anti-spam solution, spam emails sent by unknown senders can be filtered out effectively. It saves a lot of time which would have been wasted in determining and disposing of the unwanted spam e-mails. Currently, there exists a wide range of countermeasures to deal with spam emails. 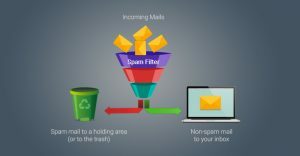 Let us discuss in detail about some of the most effective spam filtering techniques to manage this ever-increasing problem. The most commonly used technique to block spam is by filtering some common words used in spam emails. Some of the most common spam words include additional income, cash bonus and some claims you are a winner. You can filter such words or emails of such topics. Another commonly used spam filtering technique is blacklisting certain IP addresses that are known to be used by spammers. This way, you can prevent spam emails from those IPs. Avoid posting your real email address on the public lists and forms if you don’t have to. This way you can prevent spammers from accessing your email and purchasing it from other spammers (email harvesting). If you want to post your real email address on a website or something similar, use extra spaces or preferably replace the @ symbol in your email with (at). Avoid posting your entire email ID in the form that it’s used to send the message. This will reduce the chance of spambots finding your real email ID online. If you running a business, you can use contact forms on your website instead of using your real email ID. This may be your best option for reducing the amount of spam you get. Users won’t see your email ID and instead fill out the form in the web browser which will send that info to your email address. Antispam solutions such as the Comodo Dome Antispam will prevent spam emails even before they reach your inbox. Apart from automatically quarantining the spam emails, there are many other benefits associated with the use of the antispam solution. You will have a limited number of false positives, filters 99.9% of spam from reaching your inbox, etc. If you are in search of a good anti-spam solution for your company, look no further get Comodo Dome Anti-spam today! The post Anti-spam Filtering Techniques appeared first on Comodo News and Internet Security Information. The enemy in your pocket. Can you prevent your smartphone from spying on you?